The hand held Holmes stereoscope (not stereopticon) was introduced in 1861 by Oliver Wendell Holmes. It replaced earlier, less handy, stereo viewers. Cards for it were once cheap, but today are pretty pricy. Civil War stereo views are especially costly. When I was in high school I bought a viewer for 50¢ at a Salvation Army store, but they cost more these days. Once I had the viewer I made a camera out of a pair of 116 Kodaks. I used it to take this picture on my little brother in 1958. When 116 size film became unavailable I resorted to a pair of 120 Yashika reflex cameras mounted together. I haven't tried any stereo with digital technology. The View Master was introduced in 1939 and is still available. Thanks Steve. My mother always referred to it as a Stereo Opitcon. I guess even mothers can be wrong. 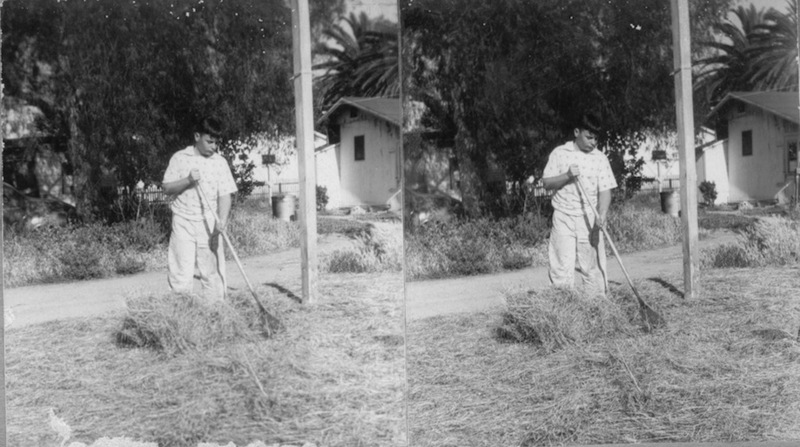 If 101 roll film was still being made, I could take stereo views to my heart's delight with my No. 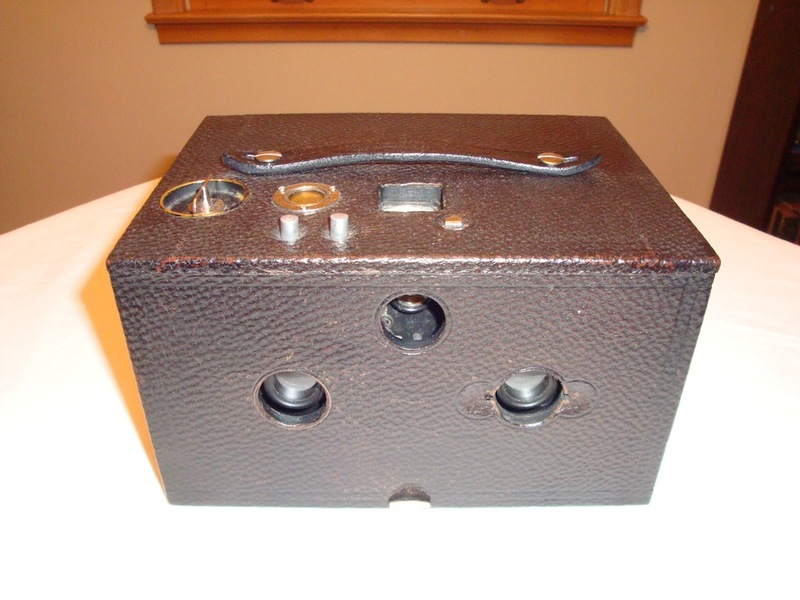 2 Stereo Kodak camera (sold from 1901 through 1905). 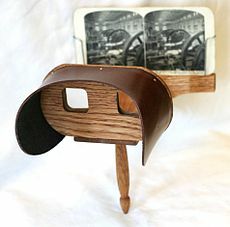 There is a place to buy a stereoscope kit, it's actually very nice, we used it in a museum to show 3-S images of historic events in the area (made duplicates of the original viewslides, to keep them preserved). Since I use only one eye at a time, I have no depth perception, and as a kid wondered why everyone liked the Viewmaster--I thought it was easier to see pictures in a book! My mind has no concept of 3-D! David - If we're ever in a parade together with Model "T's, don't follow me too close, or, better yet, let me go first! Just kidding you David, but seriously, I've never heard of that type of vision problem. Does it cause you much problem? Or, maybe it's one of those things where, never having known any different, maybe doesn't bother too much,....??? It's called "Alternator"-- I was born severely cross-eyed, so when the brain decided to put the two eyes together (this happens a bit later, like six months) it would see double vision, so it didn't do it. It tried again when I was around 12 for a few days and drove me batty! At around that time, they tested me for training me to use both eyes, but decided I was doing fine. THEY DIDN'T ASK ME!! I would have loved to have normal "Binocular" vision--then maybe I could catch a ball, etc. etc--even weld better! (It took me a long time to figure out if I was making a puddle or a hill with the molten metal--and I still sometimes get it wrong). So, I do OK, but yeah, you might want to drive BEHIND me in the parade! Night time and storms are no fun for me, most of my "landmarks" disappear! There's probably quite a few of us "half-blinds" out there. My eldest son and daughter-in-law, over a period of time, have adopted five Downs Syndrome children. The first one, a little girl, adopted as an infant, has always been severely cross-eyed, and for reasons we don't thoroughly understand, nothing can be done to correct this condition. She is very high-functioning as a Downs Syndrome child, but my wife and I feel so sorry for her, as watching her obviously shows that her vision condition is quite a problem for her. Very deliberate in simple actions like walking and so forth. She is such a sweetheart in all respects and we keep hoping that some day, the medical profession will make progress in this area, but sadly, it seems like our son and daughter-in-law have to fight for so many things for these kids, because it seems like many of their problems are not too high on the medical professions priority list! That seems odd, as I went through two operations at UC Berkeley hospital (in SF??) where they snipped the muscles of my eyes to weaken the ones forcing the eyes inward. One when I was about 2, the other when I was 5. Now the eye doctor tells me that my eyes are starting to spread out from the long-term effects--but not noticeably (at least to me?? ))so far. I recall being in the hospital about a week, with patches over my eyes for a day or two--nowadays, I wouldn't be surprised if it's an overnight stay type of procedure. Wish I could find a picture of me as a child, I've seen a few, and my crosseyedness was really noticeable! March of Dimes paid for the operations, I've been told. I also had turned in feet and had my feet in braces for a while. That' starting to cause me problems now--oh well, 60 or so years without problems--I should complain? And yes, have to be somewhat deliberate in some actions--you'll also see people like me bob their heads, up and down or side to side; were taking distance measurements, much as a bird does! And sometimes people think I'm not looking at them, because the eye I'm not using isn't focused on them. One advantage; stare downs! I can make my eyes cross! Heh heh heh! A long time friend of mine has a son that is a Downs. The boy is in his 30s now. My friend has been a wonderful and caring dad since the boy was born. They have run quite a few model T Endurance Runs together. Downs children tend to be very loving and sweet. Depending upon the severity of their condition, most can lead rich and full lives with only a little help. For what its worth. I have mentioned on other threads over the years that my dad lost one eye in a dynamite accident while I was growing up. He had to learn to do many things differently due to the loss of his depth perception. He, too, would bob his head at times and had odd ways of putting keys into locks, and so many other things he did to compensate. It is amazing what we can get used to, and often to not even realize what we do not have. For me, I have two of those stereo viewers, and about a thousand view cards in my collection. I very much enjoy them. For me, those cards are like a window into the past, almost like being there myself (in spite of most of them being in black and white). Original cards with automobiles of any sort in them are quite rare and very desirable. Several have been shared on this forum over recent years showing the Ford assembly lines. I don't have any originals of those myself. Just a poor effort by myself to print off the forum. I am not that good with computers.